Acer is offering three LED display models boasting up to an ultra-high 2560 x 1440 WQHD resolution and large 27- and 29-inch screens for multitasking, viewing two images at once and/or replacing a multi-monitor set-up. The new monitors offer excellent viewing angles up to 178 degrees both horizontally and vertically. A consumer model boasts 10-point multi-touch technology in a Windows 8 compliant design for pinch-to-zoom, rotating images and scrolling through web pages. It can also tilt back from 30 to 80 degrees, which is practically flush with the desk for enhancing comfort and making the most of its touch capabilities. Designed for both professional and consumer users, two of the new models feature a multi-function ErgoStand with tilt, swivel, pivot and height adjustment, and a clever design that stores common office items and keeps cables organized. All models deliver excellent connectivity, multi-monitor support and energy savings. 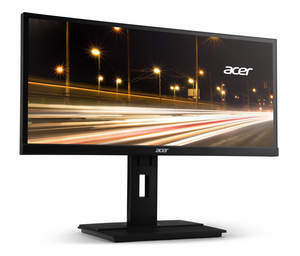 Acer is now offering its three LED monitors offering ultra-high resolution and large 27- and 29-inch screens for consumers and commercial users in Canada. "With the goal of providing our customers a superb viewing experience, our new monitors deliver brilliant images, flexibility in viewing options and generous screen real estate," said Frank Chang, director of product management for Acer. "Whether it's a gamer, an entrepreneur or a multimedia enthusiast, users will appreciate the stunning image quality, comfortable ergonomics and size of these new monitors, which are easy on the eyes and enable better multitasking." The Acer T272HUL provides a very high level of clarity with its high 1.07 billion colours and fast 5ms response time. Windows 8 compliant, it enables consumers to take advantage of the features in Windows 8 with a 10-point multi-touch screen, whether using a new PC or an old PC upgraded to the new operating system. The multi-touch technology is very easy to use. Users just need to tap on the screen to open documents and websites. They can scroll through web pages, documents, play lists and photo albums and use their two fingers to rotate, expand or reduce them to the size desired. They can also write notes directly on the screen. Offering excellent connectivity, these displays come with DVI-D (dual link), 2 x HDMI, DisplayPort™ and a USB 3.0 hub (1 up, 4 down), so users can connect to and view multiple displays simultaneously for more efficient multi-tasking. HDMI® delivers both audio and visual content via one small cable to eliminate clutter and maximize space. In addition, DisplayPort delivers every pixel to the screen as rendered by the PC with the highest accuracy and fastest response required to support the display's high resolution, refresh rate and colour depth. Acer's advanced technology makes every pixel colourful and clear. These displays deliver 16.7 million colours and a fast response time of 6 ms for the B276HUL and 8 ms for the B296CL. Acer ComfyView provides a polarizer material to reflect less ambient light and reduce glare, which provides a more comfortable viewing experience, even over prolonged periods. The new models offer excellent viewing angles up to 178 degrees horizontally and vertically, making them excellent for collaboration and multi-monitor set-ups. With an impressive 100,000,000:1 contrast ratio, they combine bright whites and rich blacks with superb gradation and detail, especially in dim or bright scenes. Outfitted with the Acer eColour Management tool, users can optimize image performance under different viewing scenarios at the touch of a button. All models also come with dual speakers and USB 3.0 with power-off charging for smartphones and other digital devices. LED-backlit, they reduce energy costs by consuming up to 68 percent less power than standard CCFL-backlit displays. ENERGY STAR® and TCO qualified, the monitors adhere to strict environmental, performance and ergonomic design standards. The Acer T272HUL touch displays are available at leading retailers with a MSRP of $999 CAD. The Acer B276HUL and Acer B296CL are available now at Acer resellers in Canada with suggested prices starting at $650 CAD. Like all Acer displays, all three models feature a standard three-year warranty(1). Established in 1976, Acer is an information and communication technology company dedicated to the research, design, marketing, sale and support of innovative products that enhance people's lives. Acer's green supply chain delivers environmentally friendly PCs, displays, projectors, servers, tablets and smartphones -- tools our customers need to explore beyond limits and experience more. Ranked No. 3 for notebooks globally,(2) Acer employs 8,000 people, and 2012 revenues reached US$14.7 billion. Please visit www.acer.com for more information. © 2013 Acer America Corp. All rights reserved. Acer and the Acer logo are registered trademarks of Acer Inc. Other trademarks, registered trademarks, and/or service marks, indicated or otherwise, are the property of their respective owners. Prices listed are manufacturer suggested retail prices and may vary by location. Applicable sales tax extra. (1) Limited warranty agreement applies. For a copy, write to Acer Customer Service, P.O. Box 6137, Temple, TX 76503.